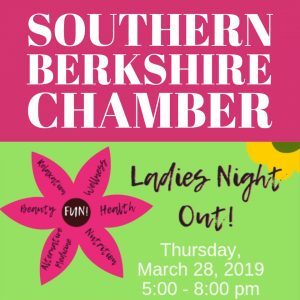 Ladies’ Night Out, brought to you by the Southern Berkshire Chamber of Commerce and the Nonprofit Center of the Berkshires! The night will be all about health, wellness, relaxation and fun; featuring guest speakers, sample give-aways, mini demos and more. Space is limited, so be sure to pre-register. The first 200 registrants will receive a FREE swag bag full of goodies!